The command line is usually thought of as serious and we usually only cover useful terminal tricks that are fairly advanced, but not everything in the Terminal has to be useful. 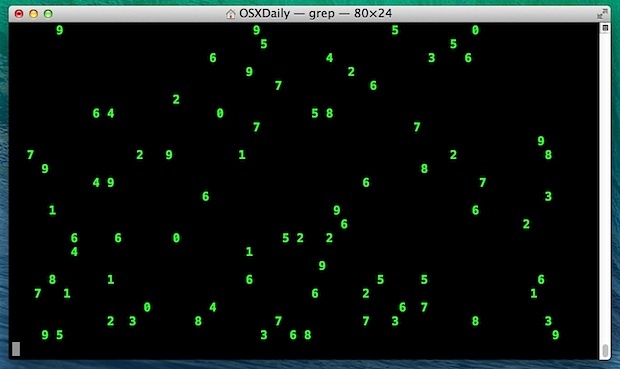 To prove that, we have three command strings that when pasted into the OS X Terminal, do nothing but scroll screenfuls of random text, binary, or your very own custom message, making your terminal window look a bit like the computer screens from the 1999 movie The Matrix. For the best looking (i.e. geekiest) results, at least change your Terminal UI settings so that the active window is styled as “Homebrew” or “Pro”, which uses green text against a black background. Or go all out and get a really fancy terminal appearance. Take the Terminal full-screen first if you’d rather have the scrolling Matrix-lookalike take up the entire screen. Admittedly this is pretty pointless but it’s fun, so whether you’re just making your very own DIY terminal-based screen saver, just like the look, or if you want to look super busy doing something amazingly complex when your boss is hovering, have at it. As usual, Control+C ceases the scrolling. I dont understand in london please can do in russian? Thanks going to try this will come back to give an update.